The maximum water to binder (w/b) ratio is an important aspect of most specifications as it is used as measure of concrete durability. The more aggressive the exposure environment, the lower is the specified maximum w/b ratio. Evidence that the effective water content has been calculated correctly is a key to conformity and central to the proof that the maximum w/b ratio has not been exceeded. 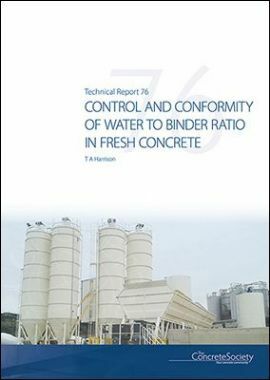 This publication describes current practice in calculating effective water content for production and conformity control with respect to w/b ratio and highlights the shortcomings and misinterpretation of batch records.